PROMOTION - GREATDEALS4YOU - BEST DEAL EVER !!!! GREATDEALS4YOU - BEST DEAL EVER !!!! Home Theater in Your Ears !!! Virtual Reality Feeling !!! Just feel and have fun !!! In real situation, we hear broadband sound in our ears as well as feel the woofer vibration of low-to-mid frequency on our bodies because the air around us is vibrating according to sound frequency. In short, the perfect sound is composed of broadband sound and woofer vibration. However, nobody has heard such perfect sound on the personal sound gadget, "earphone "until now. Now you can enjoy such perfect sound with EX2, your new-generation earphone in which multi-function and hybrid fusion technologies are applied. The best way to understand EX2 is just to experience the functions by yourself. You will like the dynamic stereo woofer vibration and plentiful sound right away, feeling virtual reality. 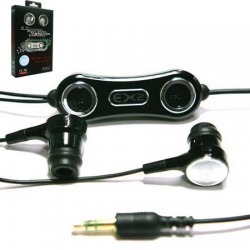 - Deliver powerful stereo body-sonic vibration and stereo generic sound directly to external ears as well as stereo woofer sound directly to internal ears. - Small generic sound volume protects auditory organ in case of high-frequency-sound. Large volume of bone-conduction clearly delivers low-to-mid frequency sound, not damaging auditory organ. 2.2CH EX2 helps the user safely enjoy the plentiful broadband sound quality and protects the user’s auditory organ at the same time. - Two volume-controllers support various modes of generic earphone, bone-conduction earphone, bone-conduction body-sonic vibration earphone and hybrid fusion earphone. Although 2.2CH EX2 has 1 body, it supports various items' effect. In order to clearly understand this new portable audio product, please just wear and listen. You will know what EX2 is, and be satisfied with the functions right away.